Join Pohutukawa Motorcycle Touring for this tour of the North Island and part of the South Island of New Zealand which will give you a close-up view of beautiful scenery ranging from rainforests, pasture land, white-sandy beaches, and rocky coastlines to rugged mountain ranges. Don't hesitate to join this tour to experience the excitement. Your accommodation will be ranging from modestly-priced cabins to deluxe-quality hotels and a couple of authentic "turn of the century"-style hotels. 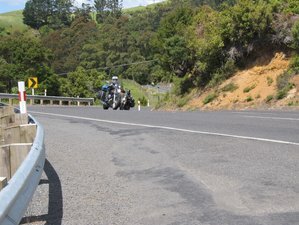 Picking up your bike and leaving Auckland, you will ride through the rich farmland of the central North Island, visiting the geothermal volcanic center of the island, along beautiful sweeping coastal roads, through old growth forests, and rugged hill country. All while enjoying gentle sweeping corners mixed with twisty back roads. You will experience the rugged mountains of the Southern Alps running the length of the South Island. This combination of North and South Island tour combines highlights from both Island. Riding from North to South and then returning North you will experience some of the best that both islands offer. The roads in New Zealand are in good condition with light traffic out of the cities. Other than road repairs, you will not be required to ride on any unsealed roads. After arriving at the Auckland International Airport, you will be met at the airport and shuttled to your hotel to check in and then to pick up your bike. Today is set aside to allow you to settle in and rest up before the adventure begins tomorrow. Visit some of the city sights. The day will include a safety meeting to review road rules and safety requirements, and a “Get to know you” dinner. Leaving your hotel and the city behind you, you will head out on lightly traveled country roads, through rolling farmland. Stopping along the way for breaks and lunch in small out-of-the way country towns, combined with viewing the amazing scenery will have you pinching yourself to make sure you are not dreaming. After a relaxing lakeside dinner, a soak in the thermal hot pools will be the perfect end to the day. Leaving the lakeside resort, you will travel deep into the thermal area of the island; this combined with a visit to one of the important cultural interpretive centers for the native population of NZ, will give you a firsthand look at how New Zealand’s Maori people lived in harmony with nature. Riding the twisty roads through the lake county, you will end your day on the coast, where a walk on the white sands will be a relaxing end to the day. Today you will follow a lightly travelled road as it hugs the coast, taking you into a part of New Zealand that is a mix of rugged hills, inspirational coastal seascapes, and rich farmland. This combined with a small population makes for an easy riding day. Tonight’s stop is on a working sheep and beef farm where you are treated like royalty, and one of the best meals you will experience. This combined with a soak in local hot pools will have you sleeping like a king / queen. After a typical New Zealand breakfast, you will continue to follow the coast through more rugged twisty roads crossing rivers and gorges, before arriving in New Zealand’s North Island wine region. After a light lunch and a visit to local points of interest, you will continue riding on well-maintained roads towards your stop for the night. On the way, various detours provide opportunities to experience local culture. Setting out early to catch the interisland ferry, you will ride to the port located in New Zealand’s capital city. Once on the ferry and the bikes tied down in well-designed supports, relax and enjoy crossing the Cook Strait. After leaving the ferry on the South Island, head out through some fantastic twists and sweeping corners with picturesque seascapes, windy roads, native bush, changing elevations, and numerous photo stops (along with some ziplining) that will lead you to your stop for the night. Make sure your GoPro is ready with plenty of back up batteries. Today’s ride menu consists of riding on great roads with thick native bush down to the sides of the road, easy sweeping corners mixed with lush open farm land. This is a day designed for fun riding, that brings you to your stop for the night. This 200-year old hotel is full of history and maybe a ghost or two. It is home to the best chef Pohutukawa have come across in the South Island. After a good breakfast, head inland to climb over the Southern Alps. The twisting climb takes you through beautiful riding scenery. Stopping near the top to watch the native parrots (Kea’s) is a great photo stop. Riding down the east side of the range leads you to the rich fertile plans of the South Island. Another great GoPro ride. Today takes you through the high center of the South Island. Riding past tranquil lakes with the southern alps as a constant backdrop leads you to the adventure capital of New Zealand. Have that GoPro changed and ready. Arriving in the afternoon, allows you to have a relaxing dinner and a ride on the Gondola above Queenstown for a spectacular view of the city and surrounds. Enjoying a lazy day in the Adventure Capital of New Zealand, today is a treat for all adventure junkies, a jet boat ride, a gondola ride, zip lining, or a more relaxed steamer cruise on the lake, enjoying some easy riding, or you could catch up on all those important things like sorting out photos, writing down all the key points of the tour so far, and even dealing with that pesky laundry thing. If you love tight corners, waterfall’s, wild bush, misty mountains, and easy sweepers then today is your day. The road will take you alongside lakes, rivers, and great photo opportunities. Also, another great GoPro day. End the day in a quaint mountain town. Today’s ride takes you along the world famous coastal highway, sweeping through fantastic corners, racing past rocky outcrops, and screaming at the top of your lungs all the way. Goes without saying that this is a GoPro leg. Mix this with some fantastic stops for one of a kind scenery and you have a ride location that is amazing. Leaving Westport, you will jump straight into some amazing river gorge riding (can you say GoPro riding). Today you are going to see; windy roads, native bush, changing elevations, and numerous photo stops. After catching the North bound Interisland Ferry, strapping your bike into specially designed supports, settle in and enjoy crossing the strait. Once off-loaded, head out of the city for some easy riding through the ranges to your stop ffor the night. Today, you will have a shorter riding day along the west coast, giving you a view of the black sands found on this side of the island. The horizon is dominated by the dormant volcano known as Mount Taranaki. This mountain and surrounding countryside has played significant roles in many films, such as The Last Samurai and some of the “Lord of the Rings” films. A ride around the base of this mountain leads you to your stop for the night. Heading north along the windswept coast before turning inland is a highlight of this tour; you will ride sweeping bends, rugged ranges, deep gorges, and along the tops of hills looking out over rich farm land and thick native forests, while traveling alongside deep rivers and lakes. Today, you will get a mix of easy riding and some local sights, including visiting a world-famous glow-worm cave and seeing native birds in a natural setting. A treat for all “Lord of the Rings” fans, you will get to walk through Hobbiton and have a drink in “The Green Dragon” tavern. This location is surrounded by some great riding roads and is a fun day. The afternoon is free time for you to catch up on all those important things like sorting out photos, writing down all the key points, and even getting that pesky laundry taken care off. Today has lots of photo opportunities; keep your camera handy. A short ride through New Zealand's largest city brings you to your stop for the night. You are now heading into parts of New Zealand that are rich in history for both the native population and the European settlers that followed them. The roads are lightly travelled and full of easy sweepers. Today will take you from seaside to hilly elevations, through open countryside and thick native bush. Along the way, you will stop in areas where the first European settlers landed and carved out a new life as they colonized the country. Stopping for a break in the seaside town of Russell lets you walk in the footsteps of these early adventurers, while you live your own adventures. Crossing the bay on a ferry brings you to your stop for the night. Today is a rest day, with a planned visit to the location where the treaty was signed between Europeans and the Maori tribes. This is a short ride from your accommodation. The rest of the day is set aside for you to explore the Bay of Islands, catch up of various tasks, walk on the beach, or to deal with that laundry thing again. Leaving the seaside town of Paihia, you will ride to visit some of the local historical sites as you travel further north. The island is getting narrower from this point on and you are never far from either coast. The influence of the warmer weather is evident in the type of forest growth, parrots in the trees and the warm friendly people. You will ride through to the most northly point of the North Island and stop for a visit to the lighthouse located there. An area rich in history, this is a must stop photo stop. After a relaxing night, you will ride south down the west side of the island stopping to walk on the “90 mile” beach, cruise through “old growth” forests, small towns, and cross one of the many harbors by ferry. As you ride, you will enter one of the oldest forests in New Zealand, home to some of the largest trees in the world. There, you can sense that time stands still. A stop to visit the largest tree in New Zealand is followed by a fantastic ride through to your stop for the night. Tonight’s stop is topped off by a guided night walk through a Kauri forest where you may see Kiwi’s, glow-worms, eels, and hear the calls of the night birds. Leaving the most beautiful location you have stayed in, you will enjoy some fun riding through easy sweepers as you work your way south. Along the way you will visit a fantastic museum showcasing the history of the area before arriving at a sleepy little seaside town for a well earned soak in hot pools before a short ride to your seaside accommodation for the night. A short walk across the lawn and you are on the beach. Watching the sun set from this spot is the perfect end to a fantastic tour. Tonight is capped off with a farewell dinner on the beach, of world-famous New Zealand cuisine. After a typical New Zealand breakfast and a short ride, you will drop off your bike and catch your shuttle to the airport. This shuttle ride is filled with talk about the adventure you have just had and the fun experienced. If you want to stay on for additional nights that can be arranged. Colin and his wife, Lynette, grew up in New Zealand and have been riding since 1973, and are familiar with most of the roads there. In 2010, Colin and Lynette established Pohutukawa Motorcycle Tours to share the thrill of riding in New Zealand and western North America. Based in Colorado, jointly they have clocked over half a million miles. They both lead tours with Lynette focusing on ladies only tours. Colin and Lynette specialize in providing their clients with unforgettable motorcycling experiences through jointly developing and providing the motorcycle adventure of a lifetime. This tour will take place on North Island and South Island in New Zealand including Mangere, Taupo, Ohope, Whiorau Station, Palmerston North, Nelson, Blackball, Geraldine, Queenstown, Franz Josef, Westport, Picton, Whanganui, New Plymouth, Cambridge, Helensville, Paihia, Waitiki Landing, Kaihu, Orewa, and Auckland. Shuttles (transfers) to and from hotel, airport, and bike rental location. A reservation requires a deposit of 35% of the total price. Pohutukawa Motorcycle Touring offers packaged and customized motorcycle tours in Western USA, Western Canada, and New Zealand. Please note that tours booked with dates including the Christmas and New Year period (December 25 - January 4) will incur extra costs dues to accommodation price rises over that period. There may also be a minimum stay period in some locations of 2 - 5 days. Prices include all taxes, shuttle fees, ferry fees, and event / park entrance fees. There are minimum 3 riders required for this tour. Tours can accommodate 1 or 2 riders alone, with different prices; please inquire. 5% discounts for all seniors - 65 years or older with the full deposit paid; (cannot be combined with advance booking discounts).